Email Templates are for use in the Communications area of the internal application. Create email templates for bulk emails you send on a regular basis and need quick access. Consider creating templates with a preset user name and email address that replaces the name and email of the current user. You can see your existing templates listed on the grid. Click and drag the Reorder icon to change the order of the E-Mail Templates. You can create new email templates from within the Communications area of the navigation. From the Communications menu, click the Templates option. 1. Click the Add New (Template) icon. 2. Complete all applicable fields. •To: Click the Add link to add existing records. You can add multiple records. 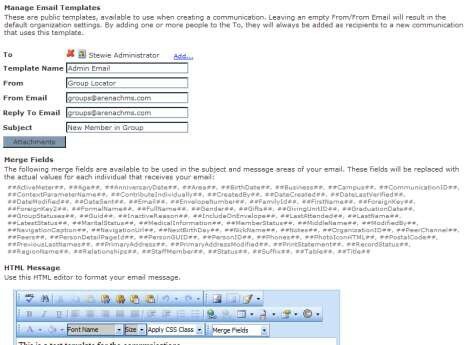 You can also use this as a cc field for email communications. •Template Name: Enter a name for this template. •From: Enter a name for the sender, if desired. •From Email: Enter an email address for the send, if desired. •Reply to Email: Enter the reply email address. •Subject: Enter a subject for this template, if desired. •HTML Message: Using the full HTML tools, format this template, as desired. •Text Message: (not shown) Use this text area to enter the message that you would like people to receive when they cannot view your HTML message above. If you leave this area blank, the system attempts to strip the HTML code from your message above when sending to text-only email clients. 3. Click the Save button to save the template for use in future communications. 4. From the Communications menu, click the Templates option and your template displays as an available template option.